John Foley, S.J. is a liturgical and classical composer, theologian, liturgist and writer. 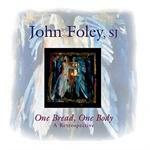 John Foley's music, when he was a member of the St. Louis Jesuits, has become a milestone of contemporary worship. His best-loved songs include Earthen Vessels and Turn to Me from the Earthen Vessels CD and Come to the Water, The Cry of the Poor and One Bread One Body from the One Bread One Body CD. In 1993, John became director of the Center for Liturgy at Saint Louis University, a national think-tank for studying and teaching the liturgy. Includes: Come To The Water, The Cry Of The Poor, I Rejoiced When I Heard Them Say, and Our Help Is From The Lord. Includes: Come to the Water, Earthen Vessels, For You Are My God, The Cry of the Poor, and One Bread One Body. Includes: Dwelling Place, Only in God, Take Lord Receive, and Turn to Me.